When BMW enthusiasts crane their necks toward the night sky, their thoughts might often turn to coveted stars from the M galaxy. 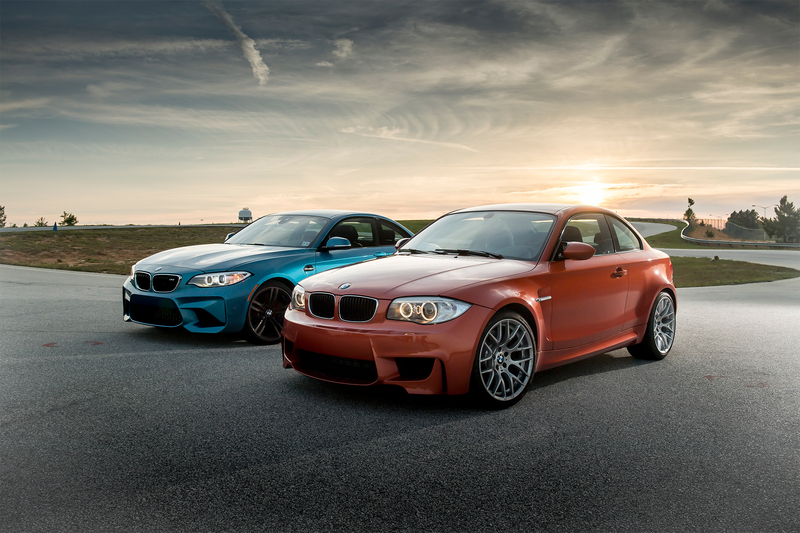 Whether it's the E30 M3, Z3 M Coupe, E46 M3, or E39 M5, many longtime fans consider the cosmic formula of on-road performance, track athleticism, and a unique engine to be inviolable dogma. Then there's the new BMW M2 and its predecessor, the 1 Series M. This terrible twosome managed to break free from the usual orbit, powered by inline-sixes that are not only turbocharged but are also based on engines in more "pedestrian" offerings such as the M235i and Z4 35is. Yet the limited-run 1M sold out quickly in the U.S. in 2011-'12 , and the M2 waiting list in some regions still runs to almost a year. The best M cars of this decade appear to bend the rules and still come up roses. Seen together, it's no mystery why this duo draws people to it. Morning's first beams of light dive out from the Blue Ridge Mountains' haze, draping fat, flared fenders and sculpted bumpers in a warm Carolina glow. Muscled chins jut out with gaping mouths, hungry for gusts of chilly, high-speed air. The cars look almost cartoonish, like ripped, 'roided-up versions of the compact, garden-variety 1 and 2 Series coupes. "The M2 looks like a scrawny kid that spent way too much time at the gym," says racer and contributing writer Andy Pilgrim. "Same for the 1M," I reply, "except its weight room is dangerously close to a nuclear power plant." All morning we bob and weave the 1M and M2 around miles of twisted, undulating pavement. 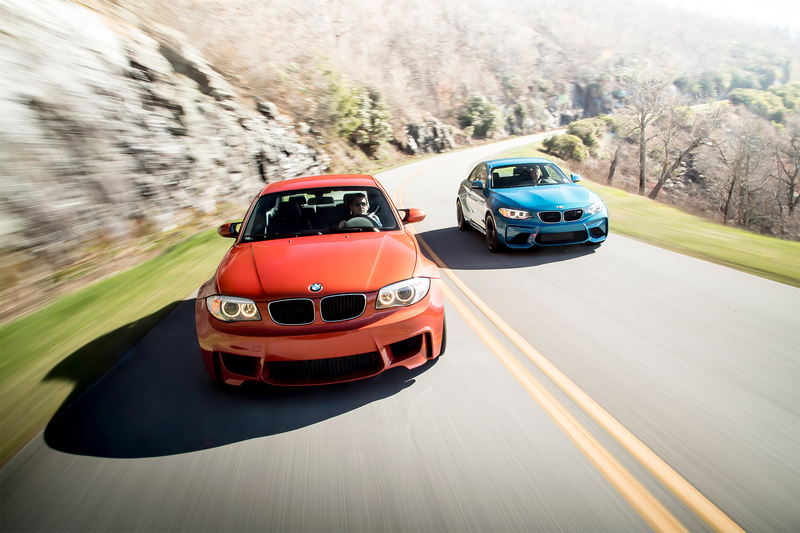 From cruising the gorgeous Blue Ridge Parkway to thrashing apexes through hill country, we start to sort out what makes these two cars special and how they've managed to pass the M torch from one to the other into the modern era. Ever the racer, Pilgrim takes the shortest route to the 1M keys, so I start out in the 2017 All-Stars-winning M2. I've gotten to know it well since its arrival in our Four Seasons fleet, but this is a car that always charms anew. Just firing up the 3.0-liter turbocharged straight-six is an aural treat, the quad-port exhaust belching out sensational growls and pops with every roll on the floor-mounted gas pedal. Mated to a seven-speed dual-clutch automatic transmission, the engine's meaty 343 lb-ft of torque is always at the ready, hurtling the glittering blue coupe down North Carolina's Highway 215 with aplomb. As the road ebbs and flows along the paths of the many creeks in and out of Lake Logan, the M2's stout and willing chassis abides every transition with confidence. Smooth Carolina roads flatter its rigid suspension, which is decidedly less forgiving on roads in metro Detroit. I hop on the radio and point out a place where we can pull over under the shade of some tall oak trees. Pilgrim pops out of the 1M, a big grin on his face. "Edgy fun, this one. Glad I had my coffee," he says. "No-nonsense interior, quick-shifting gearbox, and a really usable steering wheel with a small and ideal thickness, more like a race wheel." He's right. The M2's fatter, wider helm feels less maneuverable working it side to side through tight switchbacks. The 1M's driving position and seat, however, are noticeably less satisfying. It feels like you're sitting up high and on the seat rather than in it. Otherwise the two cars are clearly related, bearing similar Alcantara door trim, colored contrast stitching, clear sight lines, and classic illuminated orange gauges that are simple to read. With Pilgrim in the M2 in front of me, drowning out the relatively tame sound of the 1M's intake with the M2's raspy roar, we make our way down U.S. Route 276 into South Carolina. This road is fiendish, a relentless barrage of blind corners and constant elevation changes. I keep the 1M in third gear, its 3.0-liter twin-turbo straight-six summoning juicy torque (up to 369 lb-ft on overboost) throughout the rev range. Its hydraulic power steering is sharp and vivid, and every little twig and rock littering this silent forest serpent of a road announces itself to my sweating palms. This car on this road at this moment - I'm not sure it gets any better. Just as I start to savor it all, I realize I'm losing ground to Pilgrim and the M2. From out over the 1M's stubby front end I can see him dialing in the M2's rear end before he enters corners, sliding the tires carefully as the exhaust barks with every one of his paddle-selected downshifts. Where I'm trying to manage the 1M's famously twitchy mid-corner balance, Pilgrim is hard on the throttle. The Active M electronic rear differential is working silently as he sails off beyond the crest of a hilltop and around a cliffside. When I finally see him stopped on the shoulder on a straight stretch, I join him, grateful for a chance to slow my pulse. "I couldn't disagree more with the people who go on about dead-feeling electric power steering and a disconnected chassis," he declares. "Excellent weight, razor-sharp response, and predictable precision. Better road feel in the 1M, but that's it." Granted, Pilgrim is a professional racer. I am not. But we both agree the 1M is more prone to sudden oversteer under quick transitions, owing to its 1.3-inch shorter wheelbase and its mechanical rear differential. The M2, especially with its more modern traction- and stability-control systems, is simply an easier and more forgiving car to drive fast. To see how they hold up on the track, we visit the BMW Performance Center in Greer, South Carolina. Just a stone's throw from BMW's U.S. manufacturing plant in Spartanburg, the Performance Center is home to a driver training school run on a purpose-built track that combines high-speed sweepers with decreasing radii, evil little low-speed corners, and a huge dip that's sort of like a junior version of Mazda Raceway Laguna Seca's corkscrew. Helping us on our holy quest to vanquish rubber is the facility's chief instructor and stunt driver, Matt Mullins, whose experience with each car is extensive. "The thing with the 1M is that once the boost kicks in, you're gonna need either fast hands or a plan," Mullins advises. "Otherwise you'll find yourself backward." He's a huge fan of the car, though, and confesses he and several other instructors harbored plans to buy one of the eight cars allotted for Performance Center use once their two-year service life was exhausted. "We kicked the crap out of those cars through 10,000 miles on each and 12 sets of brakes and six clutches for the whole bunch. We all thought we'd be able to get them on the cheap given what they'd been through, but they still sold for more than $50,000. Oh, well. " The rear badge wears no number, just the letter M, as if that's all that needs to be said. On the track, both Pilgrim and I can see why Mullins is still wistful about the M that got away. The 1M is about 210 pounds lighter than the M2. It shows. 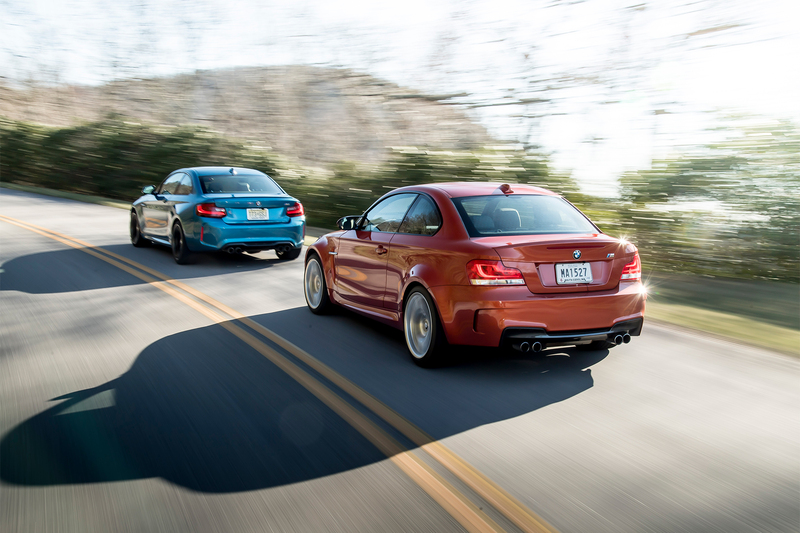 There's an agility and nimbleness to the way it turns in and pivots, although the M2's bigger footprint in general quells much of the former's nervousness in high-speed corners. The M2 hardly needs more than ill will and a stab of the throttle to rotate, but it's easier than the 1M to manage the chassis balance and power the car out of corners. "If you can tame it, though," Pilgrim contends, "the 1M is faster coming off the corner." For the sake of curiosity, Pilgrim ran both cars hard around the track. Each wore the same Michelin Pilot Super Sport tires, 245/35R-19 in the front and 265/35R-19 in the rear. All of us were somewhat surprised to discover the 1M was a mere 0.4 second off the pace of its successor: The M2 did the deed in 1:21.78, versus 1:22.22. "I give a lot of credit to the M2 for the win-civilized and track quick," says Pilgrim. "Its extra power and poise, combined with its automatic transmission, gave it the edge." It wouldn't shock us to see the 1M even closer on the stopwatch at this track if it had a DCT like the M2 instead of a six-speed manual. The 1M's allure is undeniable, certainly in part because it is so hard to come by. BMW sold just 740 examples in the U.S. and only 220 in Canada during the car's short run. The rear badge wears no number, just the letter M, as if that's all that needs to be said. Seeing one in the flesh at all is a rarity and a delight. But perhaps what we all appreciate most about that car is how, like a comet leaving a streak of gleaming dust in its wake, it blazed the trail for the M2, which considerably more customers will be able to enjoy - something that has not been mentioned enough by the enthusiast media. Yes, there's that yearlong wait list plus perhaps inevitable dealer price markups, and U.S. availability might hover around just 1,500 per year, but BMW has no plan to severely limit the M2's run the way it did with the 1M. Either way, and even without bespoke M engines, this pair of rockets proves that the performance continuum beginning with the original 1988 M3 is still alive and in demand. Read more on Automobile Magazine.